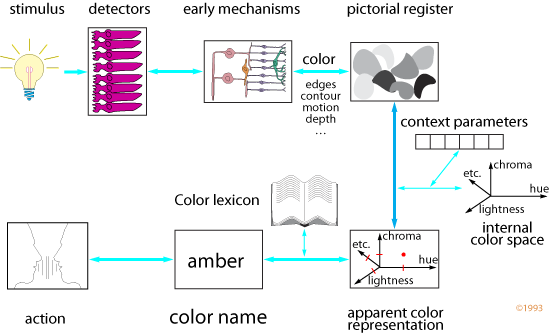 When in the late Eighties I first compiled an introductory color tutorial, I spent considerable time to come up with a diagram illustrating that vision is not hierarchical, i.e., the simple "camcorder model" of a distal event followed by a proximal stimulus which is in turn followed by a brain event is incorrect, because there is no homunculus in our head looking at the brain event. In this diagram—for which, by the way, I received quite a bit of negative criticism—this is indicated by making the arrows in the turquoise lines bidirectional, and I used to say, "at every level there is feedback." The most critical people were those who believed perception is strictly bottom-up. Besides of the homunculus paradox, there has long been physiological evidence that vision has a top-down component. For example, the diameter of the center-surround fields at the cone level in the retina is modulated by a fountain of chemicals, which is global and therefore controlled by higher up stages. In fact, there are about 15 different hormones implicated in retinal fountains. More in general, chemical messengers (peptides) are more important than electrical signals for propagating information in the body (see Susan Greenfield). At the Color Imaging Conference in San Jose last November, Kathy Mullen presented some very interesting new results obtained through fMRI studies. For example, much more information flows from the cortex to the LGN than from the retina to the LGN. As all the cycles on my PC are consumed by a long backup, I am catching up with my reading. I am looking at Kaspar Meyer's perspective Another Remembered Present on page 415 of Science volume 335 (27 January 2012). First of all, I had the direction of the feedback backwards. If we have a mental model of reality and use the visual system to confirm or adjust it, then the feedback is from the bottom in direction up, not the other way as I was saying. Meyer writes that "A particularly intriguing observation is that while the initial bottom-up activation sweep along the sensory pathways can accomplish stimulus processing of considerable complexity and yield certain automated behaviors, conscious awareness of a sensory object appears to depend on top-down signals." After presenting two influential theories of consciousness, Meyer cites some recent physiological findings and concludes: "Taken together, such data suggest that top-down signals, contrary to their common designation as 'feedback signals', have more than a modulatory function: They can reconstruct neural representations of considerable resolution in the early sensory cortices. Why would the conscious mind be grounded in dispositional records held in convergence-divergence zones, rather than the 'raw' version of reality initially established in the early sensory cortices through bottom-up signals from the thalamus? One potential answer is tied to prediction: The brain 'constantly and internally [generates] varieties of hypotheses and [tests] them upon the outside world, instead of having the environment impose (instruct) solutions directly upon the internal structure of the brain'."